Mormon Wookiee: #45: How to tell your kids that Star Wars isn't real. #45: How to tell your kids that Star Wars isn't real. A few months ago, a couple of people sent me this hilarious public service announcement about dads who struggle knowing how to their kids that Star Wars isn't real. I fear that in the not-too-distant future, this is a bridge I too will have to cross. Enjoy! If only this were what actually happened! 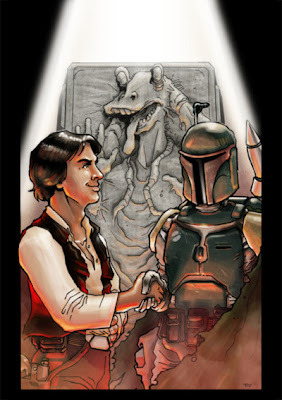 Found at Han's Payback on deviantart. We went and saw Phantom Menace this weekend (I even wrote a blog post about it LOL) and I'm so glad it's over. If they just took out Jar Jar and Anakin and Padme and left in pretty much the Jedi and the Sith it would be such an amazing movie LOL! Amen! I keep praying for the day that George Lucas releases an Episode 1 Jar Jar free edition! :) But, I still love it, despite my complaints! Although I get why people hate on Jar Jar, he is a part of Star Wars and for better or worse - not going anywhere. Funny thing is when I went and saw TPM in 3D, twice, both times people were laughing at the Jar Jar jokes and antics. I couldn't believe it myself - but I think the Jar Jar hate is waning. With the new generation of SW fans growing up, Jar Jar is now just as much a part of Star Wars as R2, 3PO and Chewie. BTW - my kids, 7, 10 yrs old, like Jar Jar and think he's funny.